Perhaps you’re doing an original installation and want to know how to ground a CB antenna. Perhaps you’ve already installed it, tested your Standing Wave Ratio (SWR), found it too high and want to improve your CB antenna grounding. Or, perhaps you’ve noticed that you’re not getting the CB radio performance that you should be. In any case, the first step is to test your CB antenna’s grounding. You’ll need a multi-meter to check your CB antenna's ground. If you need to know how to use one, read this article on Testing for Continuity. 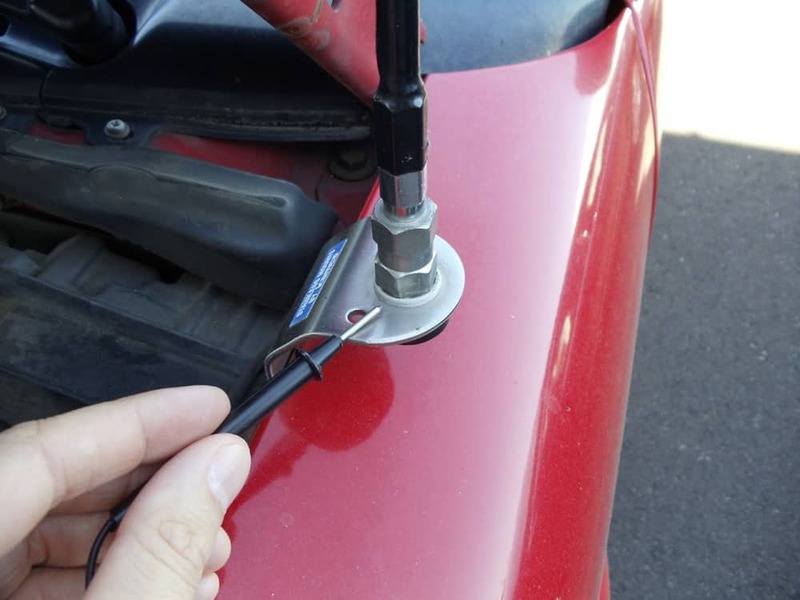 An easy way to test your antenna's ground is check continuity between the CB antenna mount and your vehicle ground, because if the antenna mount is well grounded, so is your antenna. To test for continuity of electrical signal, you will need to touch the probes for your multi-meter in two locations. You can use either the red or the black probe to touch either location. The following provides step-by-step guidance for testing the CB antenna ground. 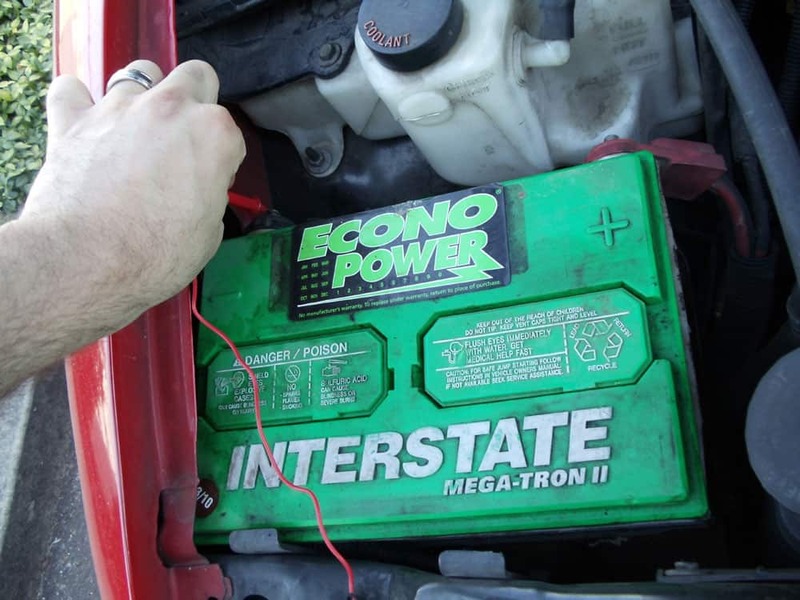 Be cautious working around your battery as you complete this step. 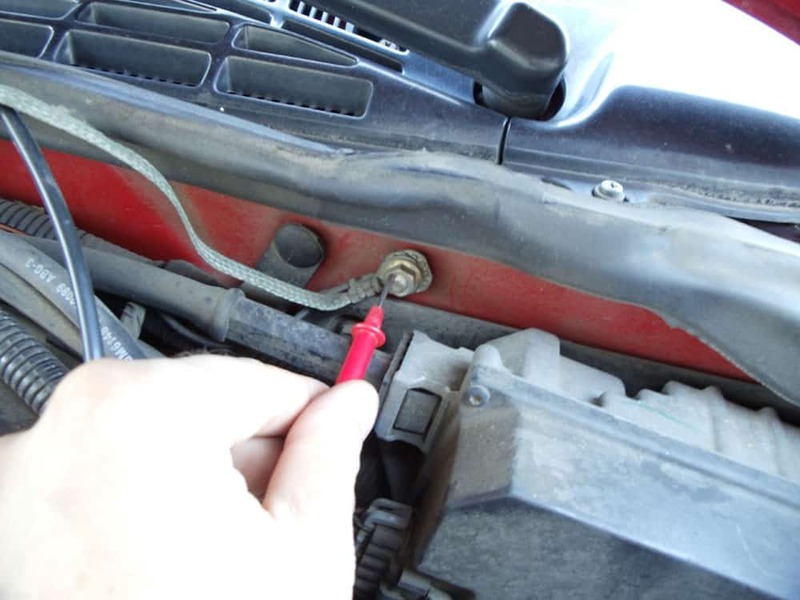 The second probe should touch the negative terminal on your vehicle's battery (marked with a minus sign). Take care not to touch the positive terminal (the one marked with a plus sign). If it’s not possible to reach both the CB antenna mount and the negative terminal of the battery with the probes, find a good ground on the vehicle (such as the one pictured) and use that for the second probe's contact point. A ground plane, also called counter poise, is the reflective unit in the system, while the antenna is the reactive unit. Most mobile antenna installations use the metal part of the vehicle such as the chassis and the body for the ground plane. There are systems that don't require ground planes; those use the shield in the coaxial cable as a substitute. Be aware that the hardware for the ground plane and no ground plane systems are not interchangeable. coaxial plug, making it easy to ground the CB antenna mount. If your antenna mount is one that is designed to accept a coaxial plug (such as the 2 ended PL259) or a PL259 with a fire ring on the other end (such as the FireStik MU8R Single Antenna CB Coax) then your work is easy. Just make sure that the mount is attached to the frame of your car or truck securely, and you should be good to go. If for some reason you need to correctly attach an end to the coax cable (perhaps you're making your own), this reference has pictures step by step for attaching both screw-on and crimp style connectors to a coax cable. Here is a technical reference for what’s inside the coaxial cable with a picture of what you’ll encounter if you strip it back. If your antenna doesn’t accept a coaxial plug then you’ll need to provide a ground another way. Although some CB owners use 10-gauge wire for a ground, braided ground strapping is preferable. That’s because of reactance. Reactance can change the wire into an antenna rather than a radio frequency (RF) ground, which is the opposite of what you’re trying to accomplish. Bonding is another term for strapping. The purpose of bonding is to pull together as much of the metal in the vehicle as is practical to provide the best ground possible. If your vehicle has a unibody, you’ll experience fewer problems with incoming and outgoing RF interference because everything is welded together. Even most of those vehicles, however, have sound barriers for the engine and exhaust systems, and those need to be bonded to provide maximum continuity for RF signals. Pickup trucks and other vehicles with a frame and body need to be bonded, no matter where you mount the antenna. On a truck, bond all four corners of the bed to the chassis and to the cab to avoid what could seem to be RFI (but actually is a ground loop). One way to ground is through the trunk lid. A set screw under the lip of the trunk might be a very handy spot to ground your system, but because the trunk lid hinges probably won't be getting a good ground, you may need to add an additional ground strap. To do that, you can take a short flat braid and connect one side to the frame and the other to the trunk lid. Be sure to leave enough length so the trunk lid can open, but don’t leave a lot of extra slack in the strap. A similar way to ground is through a nearby door. If you choose to do that, you’ll need to bypass the door hinge by running a ground from the door to the door pillar. Worth mentioning again is that the most important part of getting a good ground is to attach the ground to metal rather than plastic or other materials. You also need to place the hot side of the coaxial cable to the antenna itself. The ground is the side that comes from the shield of the coaxial cable. The following are a few additional suggestions of ways to ground your antenna. To get a better ground, you could move the mount and the antenna to a different location with a better ground. Or, you could add an additional grounding strap to the mount. If you aren’t concerned about appearances on your vehicle where your antenna is mounted, you could (gasp) scrape the paint off underneath the mount to have a metal-to-metal ground, but would be the least desirable option to most of us. If, after establishing a good ground, you still are having trouble with your antenna, you can find helpful information in our CB Radio Troubleshooting Guide.